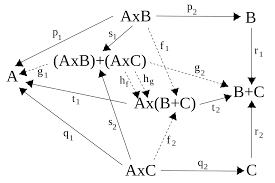 Could I use 网形成 to describe a "network" of things with arrows going between them, like this? Dictionaries give 网络 for "network." But it seems to me that today 网络 mostly means the internet so it is not a good word for this. Am I wrong about that? Another possiblity would be just 网. But I am not sure how that would sound to people. A friend gave me the suggestion:树状图 but yours has more interconnections than a simple tree diagram, more like a 'bramble diagram'. Not the answer you're looking for? Browse other questions tagged translation technical or ask your own question. Can I use 我的腿累了 for “My legs are tired”? Does the word 酱 in 酱香 refer to 醬油? Is this dictionary Chinese, Japanese or both? Which is a better translation for the sentence “Let's make a website for remote sensing and photogrammetry real.” which will be used as a slogan? What is “singleton set” in Chinese? How do I say “I just went to the shops”?